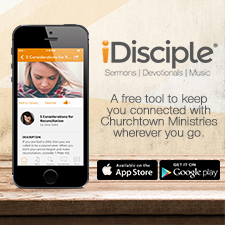 Are you a women’s ministry leader who is looking for unique ways to engage your women in ministry? What about involving them in a project that has a new twist on the God Box? Consider ministering to those whom are in a season of illness, uncertainty or depression with a God Box Gift. Each member of your ministry group may purchase or make contents that are appropriate for this sweet display of tender love and care. 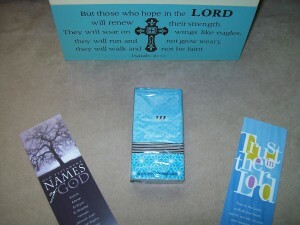 The traditional God Box is a pretty, empty box that receives small notes of worries. It is a physical place that one can use to demonstrate their trust in God for their prayer needs. They write down the things that concern them on a small note and place them in the God Box as a demonstration of their faith and trust in God. 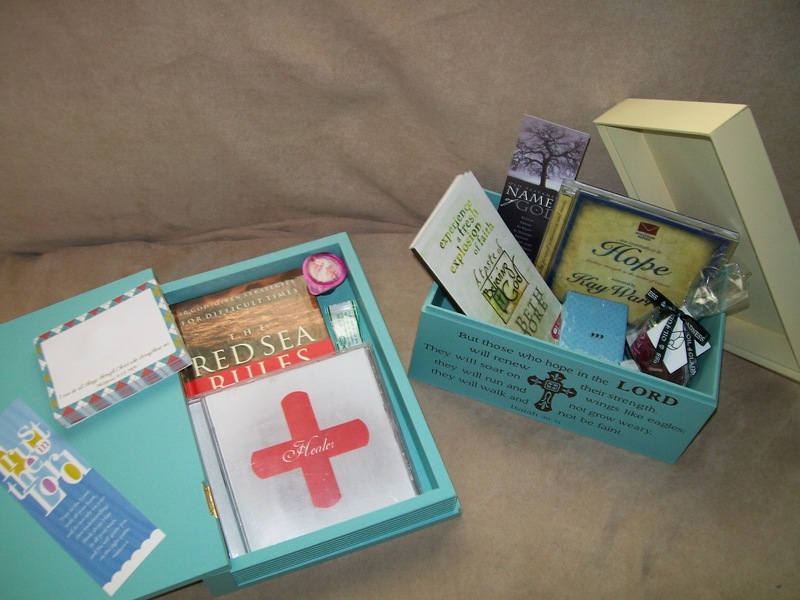 The God Box Gift includes small gifts of encouragement for your recipient as another source of ministry that lasts long after your visit. 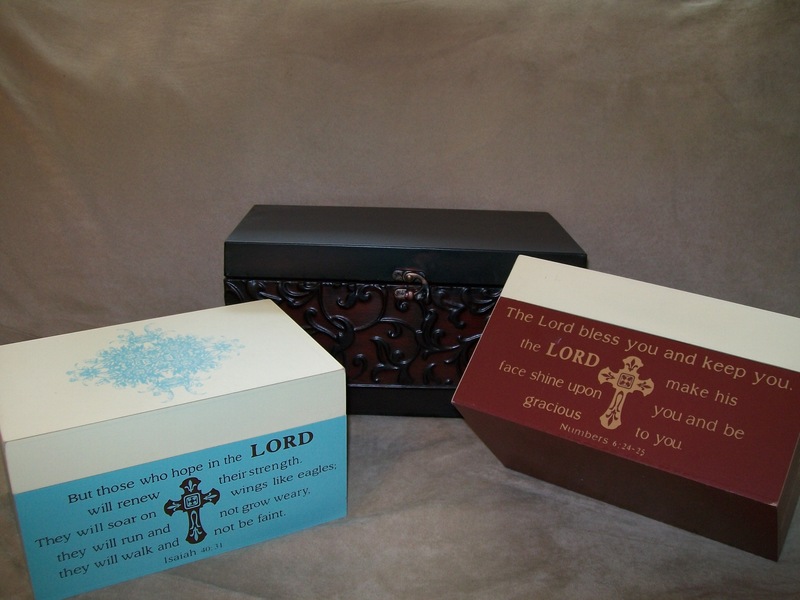 You can make your own handmade box, or purchase inexpensive ones. They may be elegant, crafty or have scripture with Christian-themed art on them like the ones below. I purchased these at a discount store. Remember to use powerful books that are small enough to nicely fit inside the box. You will want to select a book that is reflective of what the recipient is going through. 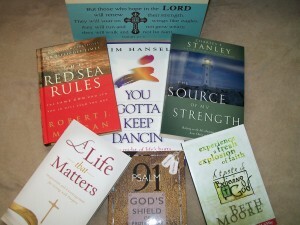 These are some of the books I have read and/or purchased for my God Box Gifts. You can buy most of these for just a few dollars at Christian book stores. You can be as creative as you wish when adding contents. 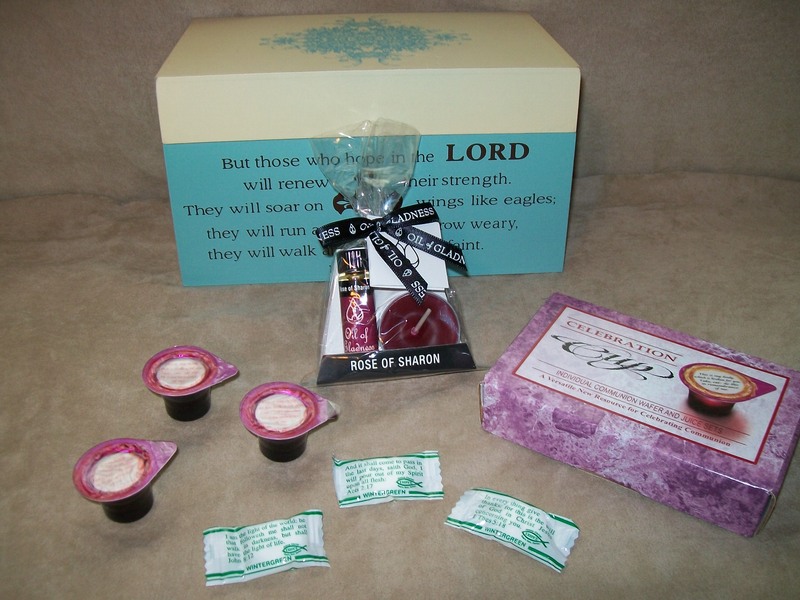 Here you see personal use communion elements, scripture wrapped mints, candle, and note the “oil of gladness”; you can even add CD’s of Praise and Worship music and hymns -whatever may be soothing and uplifting to the recipient. The inclusion of bookmarks and other reminder items are those things the recipient can take with her in her purse or a book. It is just something to help her stay focused on God while she is out and about. Make sure to include a little note pad. 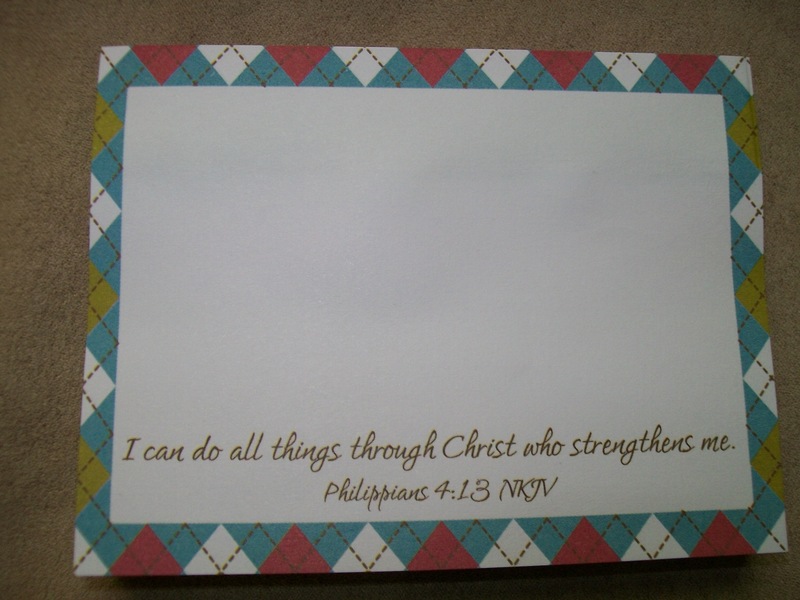 This is the pad of paper that the recipient may use to write down her concerns and burdens. You may even include a nice pen, too. Once she has penned them, she should submit them into the God Box with a prayer of trust, and leave her concerns with God. We are sorry to hear about your recent diagnosis. 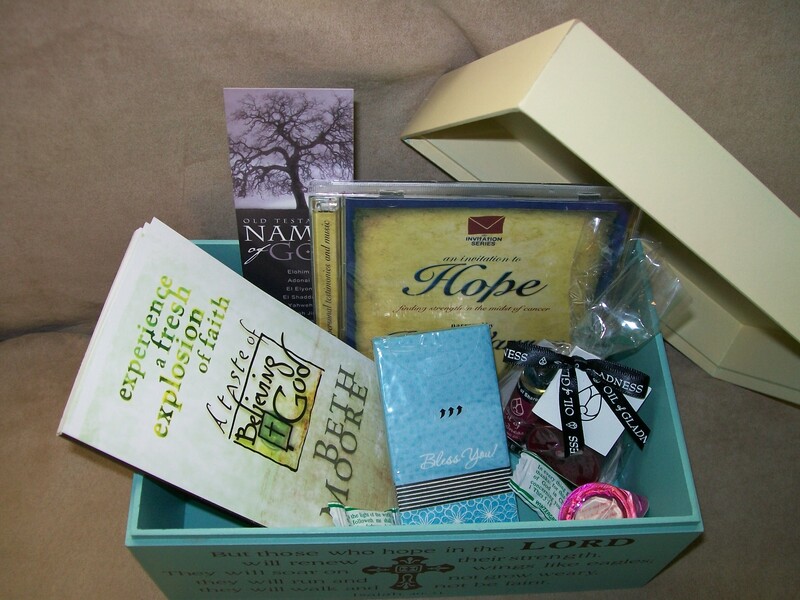 We are trusting God for a complete healing, and while we wait, we offer you a God Box Gift. Please allow its contents to minister to you. We have also included a small note pad and pen. Please use them to write down any worries and submit them into the God Box. This is a simple, yet powerful way to help you focus more on God during this season of illness. We love you and pray for you continually. Please let us know if you ever need anything. Once the box is prepared and filled, you may deliver the God Box Gift to your friend. Be rest assured that not only will the recipient be appreciative of this very thoughtful and well thought-out gift, but your group will be excited about pulling it all together. An important part of leading women’s ministry is facilitating opportunities for busy women to minister to one another.